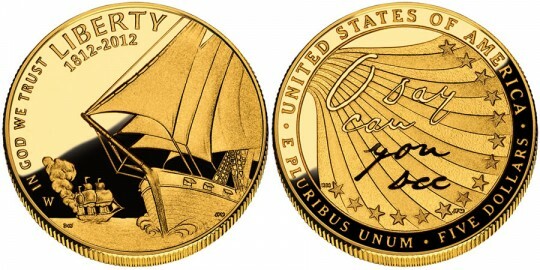 The 2012 Star-Spangled Banner Commemorative $5 Gold Coin will be struck by the US Mint to commemorative the bicentennial of the writing of the poem which would go on to become the national anthem of the United States. Up to 100,000 of the commemorative gold strikes will be minted in either proof or uncirculated condition with each composed of 90% gold. Francis Scott Key wrote the Star-Spangled Banner after witnessing the bombardment of Fort McHenry in the Baltimore Harbor by British naval forces during the War of 1812. His poem would go on to become the national anthem of the United States in 1913. Congress authorized the striking of the Star-Spangled Banner Commemorative $5 Gold Coins along with commemorative silver dollars as part of the Star-Spangled Banner Commemorative Coin Act (Public Law 111-232). Surcharges are to be collected on the sale of each strike in the amount of $35 per gold coin. This surcharge is to be forwarded to the Maryland War of 1812 Bicentennial Commission to be used for purposes relating the bicentennial celebrations and to help preserve War of 1812 structures and sites. The obverse of the coin was designed by United States Mint Artistic Infusion Program (AIP) Master Designer Donna Weaver and sculpted by United States Mint Sculptor-Engraver Joseph Menna to a theme of "The Battles at Sea During the War of 1812." It depicts an American sailing ship in the foreground with a damaged, fleeing British naval ship behind it. Obverse inscriptions include IN GOD WE TRUST, LIBERTY and 1812 - 2012. The reverse is based on the theme of "The Star-Spangled Banner" (the song) and shows the first words of the national anthem "O Say Can You See" in the handwriting of its author - Francis Scott Key. Reverse inscriptions include UNITED STATES OF AMERICA, E PLURIBUS UNUM and FIVE DOLLARS. The reverse was designed by AIP Master Designer Richard Masters and sculpted by Joseph Menna.